I am back real quick tonight to post this tag that I have made for the challenge at DragonsDream Tag It On: Challenge #163 Letter Z and a face. For the base of the tag I glued a dictionary page to it. A page from the letter Z! I used modge podge and it worked well-no bubbles or anything. Once dried I used a brayer to apply Distress Paints-ripe persimmon, spiced marmalade, and mustard seed. Then I used white (picket fence) and brayered it over so it was the last color applied. I bought this face stamp a few months ago, and this is the first time I used it. Yay! It's from Hampton Art. The light bulb is from Prima. 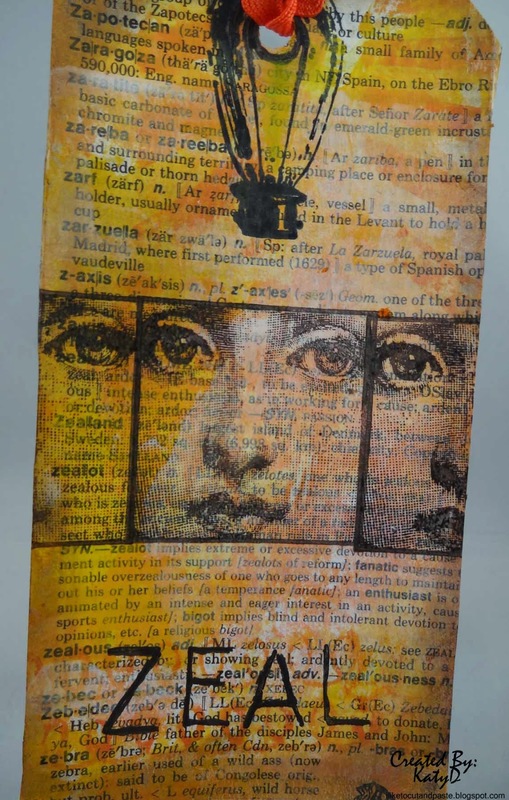 Zeal is spelled out using a Tim Holtz Stencil. I used some bright orange ric rac from my stash, also. This is GORGEOUS! LOVING the colors!!!! A fabulous tag, love the background and the face. Thanks for dreaming with us over at Dragons Dream Tag It On. I love new inspiration for using that face stamp. Your tag looks wonderful! The background is terrific.